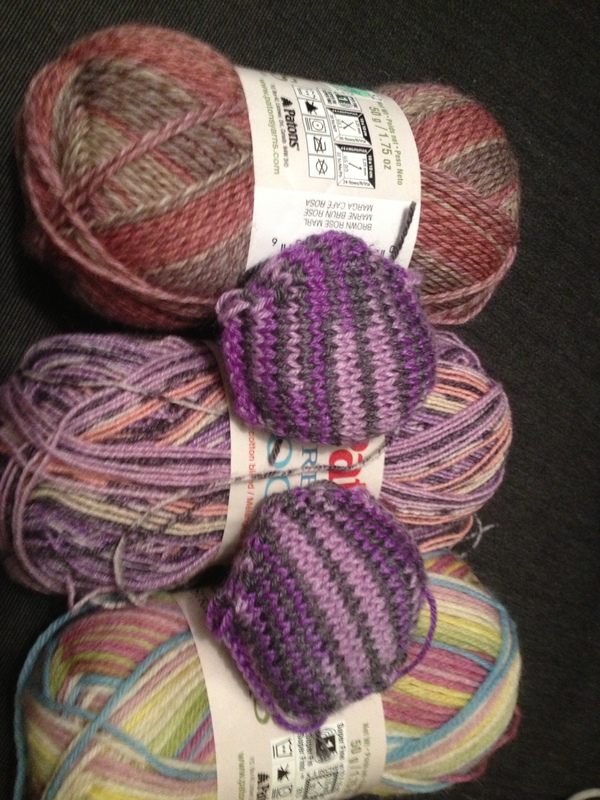 All 3 are Patons brand sock yarn. I have Patons Kroy Socks Ragg Shades in Brown Rose Marl (which is such a gorgeous dusty pink) and Kroy Sock Stripes in Sweet Stripes, as well as Stretch Socks in Grape Gumball. I have no real experience with stretch yarn, although I do have some in my stash. I picked up a Stretch Socks in a plum color a couple years ago, but I never used it. I know I’ll have to knit fairly carefully with it so I don’t stretch it while knitting. That could really mess up tension. I didn’t get many hexipuffs done this week at all. Allergies have hit me pretty badly, so I haven’t gotten much of anything done. I knit 2 hexipuffs on Monday, and then none on Tuesday or Wednesday. I’m always a little wary to knit while groggy. I know how badly things can go wrong when I knit while just tired, but a foggy brain could be much worse. Even Rizzle’s been a little groggy lately, so we’ve been just cuddling and hanging out together on the sofa most days. Sock yarn is addictive… as, it appears, are hexipuffs!